As spotted by Eurogamer, Capcom chose the Brasil Game Show to announce the fourteenth (and third new, along with Necalli and Rashid) character for the Street Fighter 5 roster: Matsuda Jiu-Jitsu expert Laura. She comes from Brazil and, like fellow Brazilian Blanka, can harness the power of electricity. Her main fighting style is a "methodical grapple", as you can see in her reveal trailer. By holding either back or forward and pressing medium punch + medium kick, Laura moves in the corresponding direction, getting her in and out of the opponent's range at will. If no direction is held during the V-Skill activation, she will perform an overhead kick. Laura gets ready to zap the competition when she activates Spark Show. 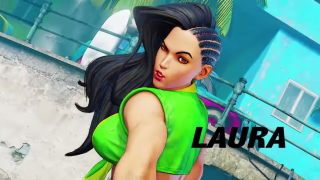 During her electrifying state, Laura's Thunder Clap projectile flies further, she deals more stun on her attacks and grabs, and moves around further during her Linear Movements. Want to give her a try? There's a beta coming to PC in a couple of weeks. Check out the system requirements to make sure you're good to go.